Are you liking the story so far? Can you believe all of the adventures that ERB can pack into one book? Don’t worry, there’s a few more to come. We must not forget the fifty frightful men. For several long minutes Jane Porter and William Cecil Clayton stood silently looking at the dead body of the beast whose prey they had so narrowly escaped becoming. The girl was the first to speak again after her outbreak of impulsive avowal. “Who could it have been?” she whispered. “God knows!” was the man’s only reply. Mechanically Clayton did her bidding, but there was no response. “We had best return to the shelter,” said Clayton. “You will be at least a little safer there. I am no protection whatever,” he added bitterly. The next day Thuran was worse. Almost constantly he was in a state of delirium. They could do nothing to relieve him, nor was Clayton over-anxious to attempt anything. On the girl’s account he feared the Russian – in the bottom of his heart he hoped the man would die. The thought that something might befall him that would leave her entirely at the mercy of this beast caused him greater anxiety than the probability that almost certain death awaited her should she be left entirely alone upon the outskirts of the cruel forest. The Englishman had extracted the heavy spear from the body of the lion, so that when he went into the forest to hunt that morning he had a feeling of much greater security than at any time since they had been cast upon the savage shore. The result was that he penetrated farther from the shelter than ever before. To escape as far as possible from the mad ravings of the fever-stricken Russian, Jane Porter had descended from the shelter to the foot of the tree – she dared not venture farther. Here, beside the crude ladder Clayton had constructed for her, she sat looking out to sea, in the always surviving hope that a vessel might be sighted. Her back was toward the jungle, and so she did not see the grasses part, or the savage face that peered from between. Little, bloodshot, close-set eyes scanned her intently, roving from time to time about the open beach for indications of the presence of others than herself. Presently another head appeared, and then another and another. The man in the shelter commenced to rave again, and the heads disappeared as silently and suddenly as they had come. But soon they were thrust forth once more, as the girl gave no sign of perturbation at the continued wailing of the man above. One by one grotesque forms emerged from the jungle to creep stealthily upon the unsuspecting woman. A faint rustling of the grasses attracted her attention. She turned, and at the sight that confronted her staggered to her feet with a little shriek of fear. Then they closed upon her with a rush. Lifting her bodily in his long, gorilla-like arms, one of the creatures turned and bore her into the jungle. A filthy paw covered her mouth to stifle her screams. Added to the weeks of torture she had already undergone, the shock was more than she could withstand. Shattered nerves collapsed, and she lost consciousness. When she regained her senses she found herself in the thick of the primeval forest. It was night. A huge fire burned brightly in the little clearing in which she lay. About it squatted fifty frightful men. Their head and faces were covered with matted hair. Their long arms rested upon the bent knees of their short, crooked legs. They were gnawing, like beasts, upon unclean food. A pot boiled upon the edge of the fire, and out of it one of the creatures would occasionally drag a hunk of meat with a sharpened stick. When they discovered that their captive had regained consciousness, a piece of this repulsive stew was tossed to her from the foul hand of a nearby feaster. It rolled close to her side, but she only closed her eyes as a qualm of nausea surged through her. For many days they traveled through the dense forest. The girl, footsore and exhausted, was half dragged, half pushed through the long, hot, tedious days. Occasionally, when she would stumble and fall, she was cuffed and kicked by the nearest of the frightful men. Long before they reached their journey’s end her shoes had been discarded – the soles entirely gone. Her clothes were torn to mere shreds and tatters, and through the pitiful rags her once white and tender skin showed raw and bleeding from contact with the thousand pililess thorns and brambles through which she had been dragged. Did you see how ERB toned down the obvious eroticism from the exposed flesh by making it raw and bloody? That was really quite masterful. The last two days of the journey found her in such utter exhaustion that no amount of kicking and abuse could force her to her poor, bleeding feet. Outraged nature had reached the limit of endurance, and the girl was physically powerless to raise herself even to her knees. Late one afternoon she saw the ruined walls of a mighty city looming before them, but so weak and sick was she that it inspired not the faintest shadow of interest. Wherever they were bearing her, there could be but one end to her captivity among these fierce half brutes. At last they passed through the two great walls and came to the ruined city within. Into a crumbling pile they bore her, and here she was surrounded by hundreds more of the same creatures that had brought her; but among them were females who looked less horrible. At sight of them the first faint hope that she had entertained came to mitigate her misery. But it was short-lived, for the women offered her no sympathy, though, on the other hand, neither did they abuse her. After she had been inspected to the entire satisfaction of the inmates of the building she was borne to a dark chamber in the vaults beneath, and here upon the bare floor she was left, with a metal bowl of water and another of food. For a week she saw only some of the women whose duty it was to bring her food and water. Slowly her strength was returning – soon she would be in fit condition to offer as a sacrifice to the Flaming God. Fortunate indeed it was that she could not know the fate for which she was destined. As Tarzan of the Apes moved slowly through the jungle after casting the spear that saved Clayton and Jane Porter from the fangs of Numa, his minid was filled with all the sorrow that belongs to a freshly opened heart wound. He was glad that he had stayed his hand in time to prevent the consummation of the thing that in the first mad wave of jealous wrath he had contemplated. Only the fraction of a second had stood between Clayton and death at the hands of the ape-man. In the short moment that had elapsed after he had recognized the girl and her companion and the relaxing of the taut muscles that held the poisoned shaft directed at the Englishman’s heart, Tarzan had been swayed by the swift and savage impulses of brute life. He had seen the woman he craved – his woman – his mate – in the arms of another. There had been but one course open to him, according to the fierce jungle code that guided him in his other existence; but just before it had become too late the softer sentiments of his inherent chivalry had risen above the flaming fires of his passion and saved him. A thousand times he gave thanks that they had triumphed before his fingers had released that polished arrow. As he considered his return to the Waziri the idea became repugnant. He did not wish to see a human being again. At least he would range alone through the jungle for a time, until the sharp edge of his sorrow had become blunted. Like his fellow beasts, he preferred to suffer in silence and alone. That night he slept again in the amphitheater of the apes, and for several days he hunted from there, returning at night. On the afternoon of the third day he returned early. He had lain stretched upon the soft grass of the circular clearing but for a few moments when he heard far to the south a familiar sound. It was the passing through the jungle of a band of great apes – he could not mistake that. For several minutes he lay listening. They were coming in the direction of the amphitheater. Tarzan arose lazily and stretched himself. His keen ears followed every movement of the advancing tribe. They were upwind, and presently he caught their scent, though he had not needed this added evidence to assure him that he was right. 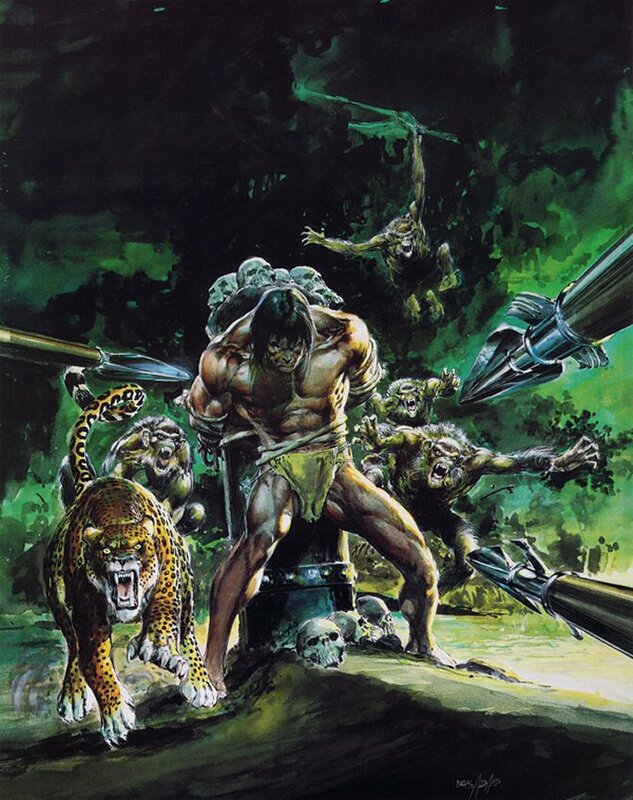 As they came closer to the amphitheater Tarzan of the Apes melted into the branches upon the other side of the arena. There he waited to inspect the newcomers. Nor had he long to wait. Presently a fierce, hairy face appeared among the lower branches opposite him. The cruel little eyes took in the clearing at a glance, then there was a chattered report returned to those behind. Tarzan could hear the words. The scout was telling the other members of the tribe that the coast was clear and that they might enter the amphitheater in safety. First the leader dropped lightly upon the soft carpet of the grassy floor, and then, one by one, nearly a hundred anthropoids followed him. There were the huge adults and several young. A few nursing babes clung close to the shaggy necks of their savage mothers. Tarzan recognized many of the members of the tribe. It was the same into which he had come as a tiny babe. Many of the adults had been little apes during his boyhood. He had frolicked and played about this very jungle with them during their brief childhood. He wondered if they would remember him – the memory of some apes is not overlong, and two years may be an eternity to them. From the talk which he overheard he learned that they had come to choose a new king – their late chief had fallen a hundred feet beneath a broken limb to an untimely end. Tarzan walked to the end of an overhanging limb in plain view of them. The quick eyes of a female caught sight of him first. With a barking gutteral she called the attention of the others. Several huge bulls stood erect to get a better view of the intruder. With bared fangs and bristling necks they advanced slowly toward him, with deep-throated, ominous growls. The brute he had addressed stopped with a look of half-comprehending, dull wonderment upon his savage face. The apes all crowded forward now, but more in curiosity than threatening. They muttered among themselves for a few moments. “What do you want among us now?” asked Karnath. “Only peace,” answered the ape-man. Again the apes conferred. At length Karnath spoke again. “Come in peace, then, Tarzan of the Apes,” he said. And so Tarzan of the Apes dropped lightly to the turf in the midst of the fierce and hideous horde – he had completed the cycle of evolution, and had returned to be once again a brute among brutes. There were no greetings such as would have taken place among men after a separation of two years. The majority of the apes went on about the little activities that the advent of the ape-man had interrupted, paying no further attention to him than as though he had not been gone from the tribe at all. One or two young bulls who had not been old enough to remember him sidled up on all fours to sniff at him, and one bared his fangs and growled threateningly – he wished to put Tarzan immediately into his proper place. Had Tarzan backed off, growling, the young bull would quite probably have been satisfied, but always after Tarzan’s station among his fellow apes would have been beneath that of the bull which had made him step aside. But Tarzan of the Apes did not back off. Instead, he swung his giant palm with all the force of his mighty muscles, and, catching the young bull alongside the head, sent him sprawling across the turf. The ape was up and at him again in a second, and this time they closed with tearing fingers and rending fangs – or at least that had been the intention of the young bull; but scarcely had they gone down, growling and snapping, than the ape-man’s fingers found the throat of his antagonist. Presently the young bull ceased to struggle, and lay quite still. Then Tarzan released his hold and arose – he did not wish to kill, only to teach the young ape, and others who might be watching, that Tarzan of the Apes was still master. The lesson served its purpose – the young apes kept out of his way, as young apes should when their betters were about, and the old bulls made no attempt to encroach upon his prerogatives. For several days the she-apes with young remained suspicious of him, and when he ventured too near rushed upon him with wide mouths and hideous roars. Then Tarzan discreetly skipped out of harm’s way, for that also is a custom among the apes – only mad bulls will attack a mother. But after a while even they became accustomed to him. He hunted with them as in days gone by, and when they found that his superior reason guided him to the best food sources, and that his cunning rope ensnared toothsome game that they seldom if ever tasted, they came again to look up to him as they had in the past after he had become their king. And so it was that before they left the amphitheater to return to their wanderings they had once more chosen him as their leader. The ape-man felt quite contented with his new lot. He was not happy – that he could never be again, but he was at least as far from everything that might remind him of his past misery as he could be. Long since he had given up every intention of returning to civilization, and now he had decided to see no more his black friends of the Waziri. He had forsworn humanity forever. He had started life an ape – as an ape he would die. 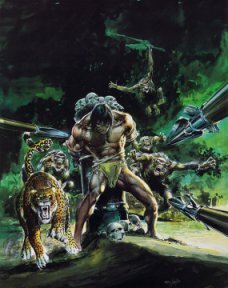 You have to hand it to Tarzan, he handles heartbreak in a very unique manner, perhaps getting a little too melodramatic at times, but what the hell, the thing about hearbreak is that it hurts like hell. He could not, however, erase from his memory the fact that the woman he loved was within a short journey of the stamping-ground of his tribe; nor could he banish the haunting fear that she might be constantly in danger. That she was illy protected he had seen in the brief instant that had witnessed Clayton’s inefficiency. The more Tarzan thought of it, the more keenly his conscience pricked him. Finally he came to loathe himself for permitting his own selfish sorrow and jealousy to stand between Jane Porter and safety. As the days passed the thing preyed more and more upon his mind, and he had about determined to return to the coast and place himself on guard over Jane Porter and Clayton, when news reached him that altered all his plans and sent him dashing madly toward the east in reckless disregard of accident and death. Before Tarzan had returned to the tribe, a certain young bull, not being able to secure a mate from among his own people, had, according to custom, fared forth through the wild jungle, like some knight-errant of old, to win a fair lady from some neighborhood community. He had but just returned with his bride, and was narrating his adventures quickly before he should forget them. Among other things he told of seeing a great tribe of strange-looking apes. “They were all hairy-faced bulls but one,” he said, “and that one was a she, lighter in color even than this stranger,” and he chucked a thumb at Tarzan. The ape-man was all attention in an instant. He asked questions as rapidly as the slow-witted anthropoid could answer them. “Where were they when you saw them, and which way were they going?” continued the ape-man. “When was this?” asked Tarzan. We’ll have to leave our cast of characters there until next time. I know what you males are thinking out there – oh, goodie, back to La and Opar. Yes, I am with you on that one.